The "Take It!" was immediate. 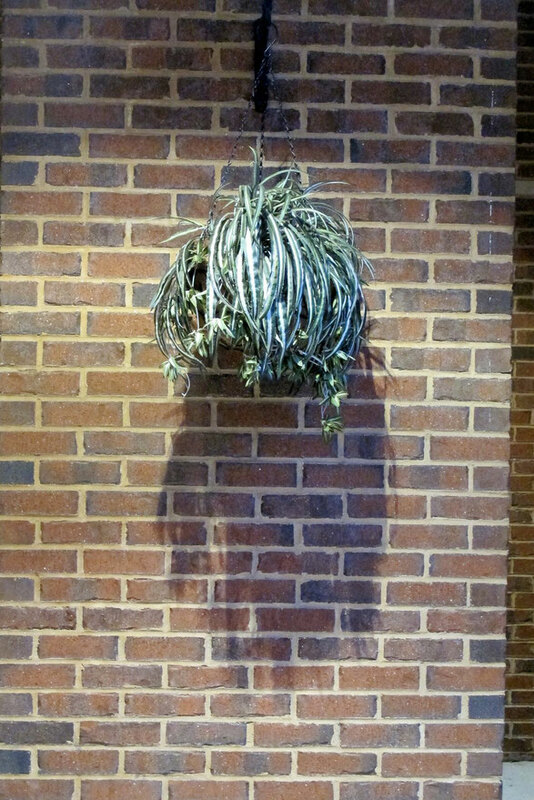 When I drove into the fairly well enclosed driveway I looked over at the hanging plant and saw the shadow formed by the overhead light cast through the random leaves that shaped the plant. Even though the fingers and the thumb are a bit obscured, there is enough distinction to call it a hand and I believed for anyone to see it that way. Aparently the lights had just come on and only from their being on was this shadow able to be formed. I immediately asked the door attendant to take a look and see if he agreed with me about the validity of the shape of the shadow. He was quite taken. He said he had never seen it before and thought it was erie but cool. I said that I completely understood for I too was caught by surprise in seeing it that way. It was one of those things that could be more than easily passed over especially when one is tending to a busy entrance. We showed it to another attendant who was equally surprised in a pleasant way. The After Take: A small but fun shared experience has been made posible to pass along and expand the circle of sharing through a photograph that was an ever so lucky catch. The fact that the photo was clear enough was yet another bit of great luck. Thanks for joining in the circle of fun. Great shadow play! The monster hand!